As low as $52.99 per oz over spot! The most popular coin in the South African Gold Krugerrand collection is the 1 oz coin. First introduced in 1967 as a means of private gold investment, the South African Gold Krugerrand was the only regular-issue gold bullion coin available from 1967 to 1979. Even after the introduction of the Canadian Gold Maple Leaf, the Gold Krugerrand remained the dominant gold bullion coin through the 1980s. Today, 2019 1 oz South African Gold Krugerrand Coins are available to you online from JM Bullion. Available to you inside of individual protective packaging or mint tubes of 10 coins! 53rd release of the 1 oz South African Gold Krugerrand! Paul Kruger is depicted on the obverse. A springbok antelope is found on the reverse. South African Gold Krugerrand coins were available from 1967 to 1980 only in the 1 oz weight. The mid- and late-1970s saw a bull market for gold run wild that pushed demand for the Gold Krugerrand higher than ever before, forcing the South African Mint to remove mintage caps on the coins and strike them to meet the new demand. All 2019 1 oz South African Gold Krugerrand Coins in this listing are in Brilliant Uncirculated condition. The coins are offered either inside of protective plastic packaging or mint tubes of 10 coins. Since its introduction in 1967, sales of South African Gold Krugerrands have exceeded 50 million ounces of gold to investors around the world. On the obverse of 2019 1 oz South African Gold Krugerrands is the image of Paul Kruger. Following Boer victory over Britain in the First Boer War, Kruger was eventually elected the first president of the fully independent South African Republic. He had previously served as a commander of military forces in the war and was an executive in the triumvirate that governed the republic before its independence. 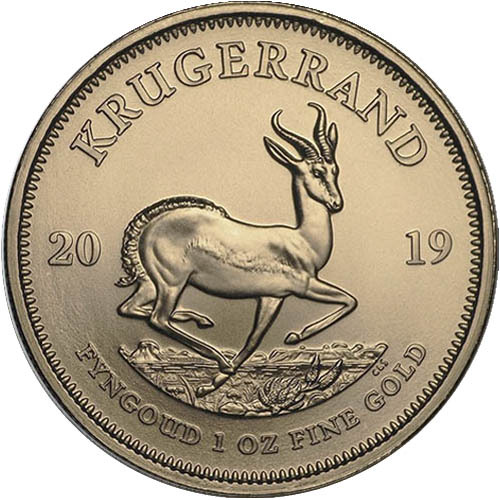 The reverse side of 2019 South African Gold Krugerrands includes the design of the national symbol. The springbok antelope is the official symbol of the modern Republic of South Africa and has featured on the coin since 1967. This design was modified in 1984 by Coert Steynberg for the Gold Krugerrand. The obverse depiction of Kruger was also updated in 1984, with the artwork completed by Otto Schultz. All Krugerrand coinage, both Gold Krugerrands and the newly-introduced Silver Krugerrands, are issued by the South African Mint and the Rand Refinery. The South African Mint is a private company working with the South African Reserve Bank to issue national currency and bullion coinage. Please feel free to reach out to JM Bullion if you have any questions about gold for sale. You can call us at 800-276-6508, chat with us live online, or simply send us an email with your inquiries.